Dr. Jill Braaten Helmin founded Imagine Chiropractic in 2008 after her graduation from Northwestern Health Sciences University. 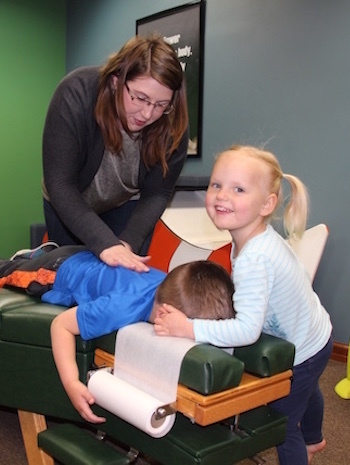 Our practice name originates from our love of family wellness care, particularly for kids. We want to foster the well-being of your children, providing them a comfortable place where they can be themselves and have fun while receiving the highest quality of health care. Dr. Carolyn Urbanski joins Dr. Jill in practice, focusing on improving the wellness of all ages – especially kids! We welcome all members of your family to experience what we have to offer. When you aren’t plagued with headaches, back pain or frequent illness, you can better care for your children. When babies and children are free from common issues like colic, reflux or asthma, it improves your whole family dynamic. We seek to keep you at the highest levels of health for your entire lifetime. Dr. Jill and Dr. Carolyn are excited about educating the public about improved lifestyle habits and healthy living. We offer workshops in and out of the office so that you can learn more about staying well. If you’d like us to speak to your business, school, group or organization, we can discuss how to maintain peak performance, better manage stress or prevent injury at home and in the workplace. In our office, you are welcome to attend workshops on a variety of topics such as ADHD, nutrition and more. Check out our events page! We offer convenient walk-in and same-day appointments. Contact our chiropractic office today to get started!